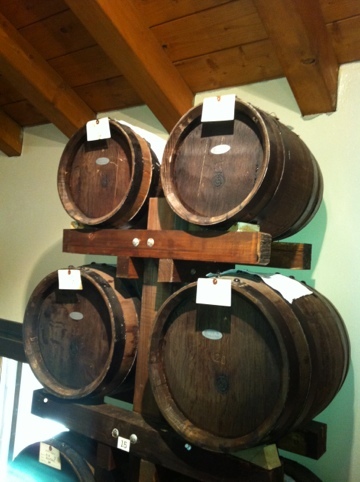 How to visit a traditional balsamic vinegar producer in Modena - Emilia Romagna - Italy. Emilia Delizia can take you to tour a traditional ACETAIA as we call the traditional balsamic vinegar producer here in Modena. Most visitors will be surprised by the difference between the "regular" or industrial balsamic vinegar and the DOP traditional balsamic vinegar that it is produced only in private houses in Modena and Reggio Emilia. Traditionally a batch of new balsamic vinegar was only started at the birth of a baby girl and it would become her dowry when she would marry. In the past centuries the aceto balsamico was only used within the family and sometimes given to important guests. It is said that the Duke of Modena had his own important vinegar attic, in his palace, important people would be introduced to the delights of the black gold when visiting Modena by the ducal family. As part of our tours we can take people to visit private villas and houses where this black nectar is still produced in small quantities in the most traditional way. How Balsamic vinegar is made in Modena. Traditional balsamic vinegar of Modena is made from initially reducing organic grape juice (must) to about 30% by just simmering the product for about 24 hours, this is to increase the sugar content in the juice. It is important to never reach the boiling point in order to preserve the friendly bacteria that are already present in the liquid. This is done at harvest time between September and October the grape must is obtained from Lambrusco and Trebbiano grapes. To age the vinegar a set of barrel is required. A mother barrel usually the lager in a set of 4,5 or 6 increasingly smaller barrels, all made of different woods such as acacia, ash, chestnut, mulberry, cherry. From this moment in autumn it will take at least 12 years of painstakingly topping the evaporated must from the last but one barrel to the last one, and the repeating the sequence from the last but two to the last but one and so on until the mother barrel is then topped up with fresh grape must. No vinegar will be drawn for at least 12 years to obtain at least the "younger balsamic vinegar". How to use traditional balsamic vinegar. The tradition wants that the precious black nectar obtained by the natural concentration of the flavours is used as a digestive at the end of the meal. It is best consumed on plastic or ceramic spoon as metal it is very cold and it would lower the sensory experience. 12 years old traditional balsamic vinegar. It has more acidity than the other vintages and the sweetness is more subtle. You will soon find out that the favours of the woods are felt on different parts of your tongue and mouth. This balsamic vinegar is particularly indicated on fresher cheeses such as ricotta or mozzarella. You can also add to meat or fish dishes. The important that is used sparingly and only added the end of cooking. The acidity decreases and the sweetness is more present, but it is not a flat sugary sensation, it is actually very complex. On your tongue you feel the taste of the blended wood tannins such as the spiciness of juniper or the sweetness of the cherry wood. At this age it is a perfect match for aged cheese such as Parmesan or even for desserts: straberries, chocolate and ice creams. 28 YEARS OLD VINEGAR and over - Only in the Reggio Emilia province. Only produced and marketed at this age in the Reggio Emilia. At this point the vinegar has lost a lot of its acidity and it the wood and the sweetness becomes even more accentuated, almost like a sweet complex black nectar. It is best consumed at the end of the meal as a digestive. The province of Reggio Emilia is also a producer of Traditional balsamic vinegar due to the proximity to Modena. The tradition was brought in Reggio Emilia as many women were marring across the 2 provinces bringing their dowry with them. During our Balsamic vinegar tour it is possible to visit Reggio Emilia producer and discover the 3 ageing typical of the area. If you want to learn more about Reggio Emilia culinary tradition please continue reading here. If you’re an all-round foodie or just love food, there are some things that you can do during your stay in Italy that are food-related and are sure to enhance your experience. Besides trying out the local cuisine and all the traditional dishes available to you, there are activities you can do to fully immerse in the world of Emilia Romagna’s food. Restaurants are a thing you really cannot miss (you’re bound to end up eating out during your vacation, and there’s plenty of excellent places to choose from), but you can also go to local producers to sample ingredients and dishes made with them for a full-on experience. And while you’re looking through reviews and suggestions from fellow foodies on great places that offer food tasting experiences, don’t forget about other pleasures available to you. 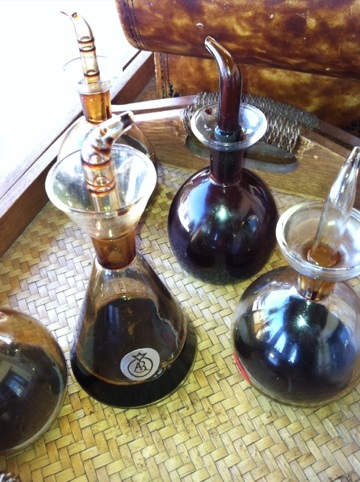 For example, wine tasting tours are a great idea – as are tours of balsamic vinegar places. Balsamic vinegar might just be a condiment, but if you get deeper into the local culture, you’ll discover that balsamic vinegar in Emilia Romagna is a whole different deal: it’s tradition, it’s pride in local ingredients, it’s about employing processing methods passed down through generations. In short, visiting the place of production of balsamic vinegar will give you a glimpse into the history of this part of Italy, and there are several options to choose from when it comes to where you’re supposed to go to have a taste of Emilia Romagna. Villa San Donnino is located in a liberty-style villa just outside Modena, the birthplace of Balsamic Vinegar, this will be a very picturesque destination if you want to enjoy the history of this product in a suggestive environment. Since the certified DOP Traditional Balsamic Vinegar of Modena is produced throughout a very limited and controlled area of Emilia Romagna, it’s something that can truly be sampled only when in this type of location. The Acetaia Villa San Donnino would be a great choice for your balsamic vinegar tasting tour, or shopping and booking through the website is recommended . Once there, you’ll have a chance to see the traditional production methods for the vinegar and taste it paired with great local dishes. On their website it’s possible to book a visit to this acetaia (vinegar processing place) to, once again, see how the vinegar is produced, get in touch with the history of this excellent traditional product, sample and purchase DOP Balsamic Vinegar – right at the heart of the beautiful city of Modena. The Acetaia di Giorgio is a tiny balsamic vinegar place, family-owned and with a focus on how the vinegar truly is a legacy passed through the generations. Another great place you can visit to explore the world of DOP Traditional Balsamic Vinegar of Modena is this acetaia, located in Castelvetro di Modena. The acetaia offers guided tours and tastings of different products that can also be purchased at the shop, along with local jams, spirits, wines, sweets and other products from Modena to pair with the vinegar. Mailing the acetaia will allow you to book a tour but also to find out about special events held by La Vecchia Dispensa, such as lunches in the acetaia, cooking classes and hikes through the vineyards. In this acetaia, you will be able to go on a tour of the place, guided by experts, to discover the secrets of the production of this interesting local condiment. During the tour, you’ll learn more about the history of the Balsamic Vinegar of Modena, the techniques employed to achieve the final product, and you’ll have a chance to taste the vinegar. Groups of 10 people or more can arrange a special tour, which includes a vinegar and local food tasting, so you’ll be able to sample cold cuts, Parmigiano Reggiano cheese, baked goods and wine typical of Modena all in the same package, for an all-round culinary experience. Free tastings are held on every opening day in the Acetaia Bompana, and you can book tours if you want to learn about the Traditional Balsamic Vinegar of Modena, other than just sampling it in all of its amazing shades of taste. The vinegar can be used in many different ways to enhance dishes, or can just be drizzled on a piece of Parmigiano cheese. This acetaia, like the other certified ones in the area of Modena, is the perfect place to sample the excellence of this traditional and local product. Purchasing some balsamic vinegar for yourself at the outlets annexed to the acetaie will guarantee top quality and an unforgettable taste of Modena to bring back home with you.